In pursuit of sweeping river vistas and the great outdoors, a young Bethesda, Md. family went west, in a manner of speaking, about 4.5 miles, securing a pristine lot on a Cabin John bluff overlooking the C&O Canal and roiling Potomac. Tasked with building what would become a 4,589 s.f. 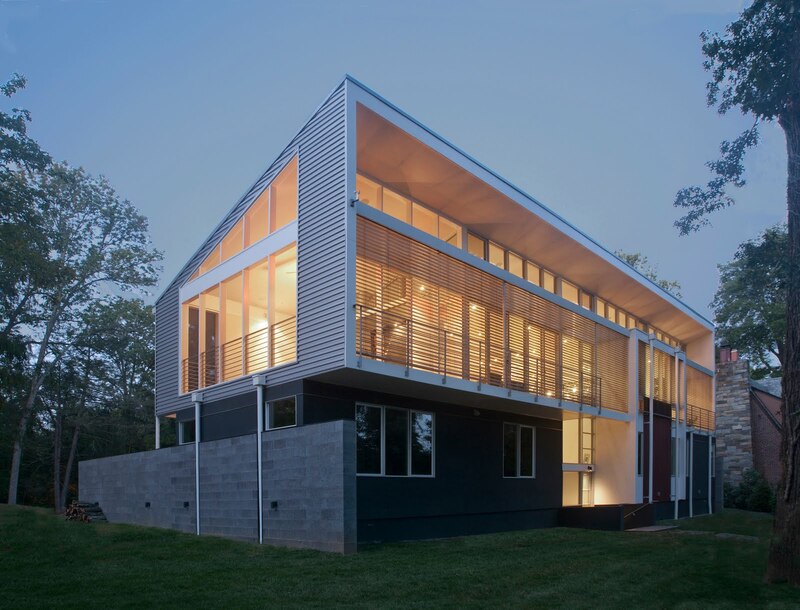 four bedroom, four-and-a-half bath residence that provided comprehensive views of the evolving terrain, ecosystems and elements in all seasons, Mark McInturff and project architect David Mogensen of McInturff Architects confronted a not-so-uncommon Mid-Atlantic region issue. With 15-foot ceilings and an expansive southwest-facing wall of glass firmly on the family’s agenda, searing sun and heat—and their impact on heating and cooling—would require more than a conventional approach to climate control. 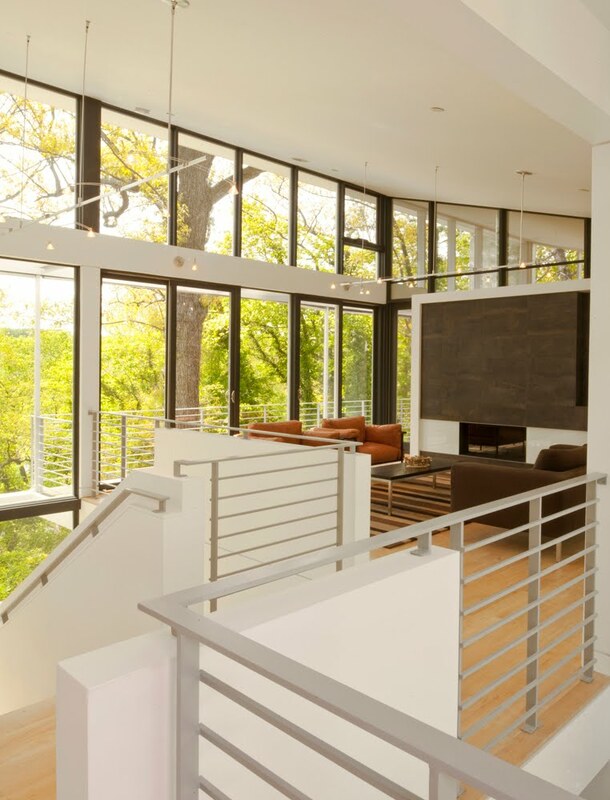 What’s more, the homeowners wanted to spend the brunt of their day in an elevated wing, embracing their surroundings with an unobstructed view. “When we first stood out there, the homeowner said she thought the main living spaces—living room, kitchen, dining room— should be on the second floor with the bedrooms below,” said McInturff, which he added is a strategy the firm often undertakes when considering the landscape. 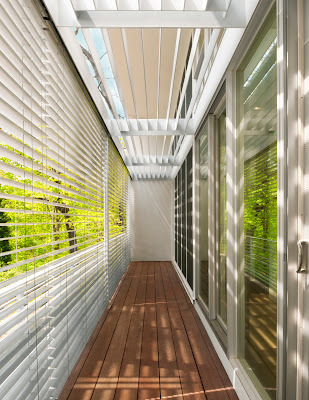 In an effort to “circle the wagons,” according to McInturff, sheathing the home in adequate shading—kind of a preemptive strike before the sun heats the glass— European technology was employed in the form of computer-controlled exterior aluminum blinds. 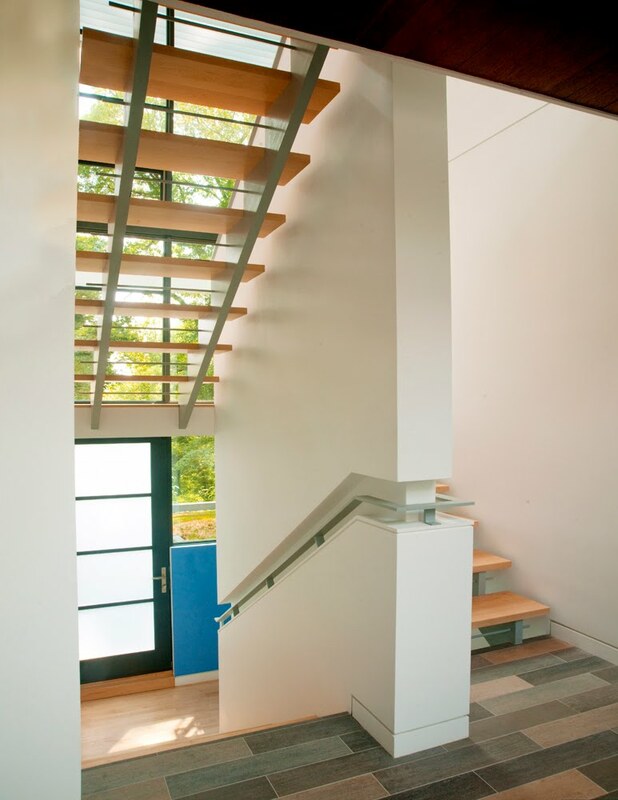 With optimal energy efficiency on the homeowners’ dance card, geothermal HVAC systems, soy-based foam wall and roof insulation at R-21 and R-38 values, respectively, radiant heat throughout and passive strategies such as cross ventilation were utilized. 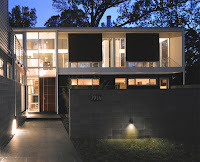 On the entry side, which faces away from the river, a pitched roof provides for an 8-foot ceiling which ascends to 15 feet, accommodating the glass wall and band of clerestory windows. 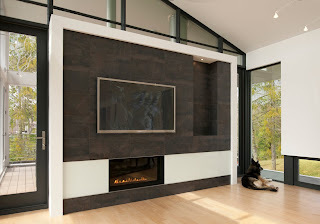 “Fifteen feet is a comfortable height which does a lot in terms of gathering natural light into the space; it becomes quite luminous,” McInturff said. An exterior overhang also precludes sun from flooding the space at this height, as the clerestories don’t have blinds. On the lower level, two children’s bedrooms with 9-foot ceiling height, a bath and a “homework room” share a courtyard, with a master suite and private courtyard completing the composition. An outside paving motif is teased inside this level with the inclusion of a porcelain-tiled entry. A guest suite is featured above a garage, connected by the upper level living spaces, but which reads like two buildings. On the exterior, factory-finished metal siding and metal-clad windows provide for a tighter, more energy-efficient envelope, with masonry used for the same purposes on the home’s lower level. When the sun goes down, indirect and strategic uplighting are key components in the residence’s energy conservation quest. According to the architect, a balcony or loggia with durable ipe decking was located off the second level on the view side. Here, too, operable aluminum blinds off the railing can protect the home and outdoor materials from the ravages of intense sun, with the added aesthetic of a modified closure providing a beautiful, dappled light. 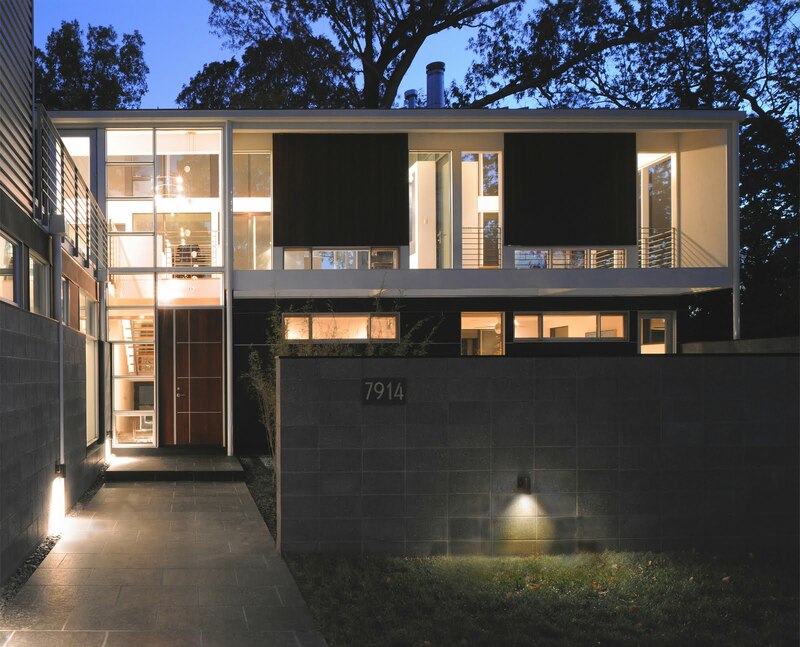 “It’s a house we really love and have put a lot of work into,” McInturff said. Gorgeous; hope that it's one day part of a neighborhood open house tour, you learn about the tour, and you post the information on your site in advance. 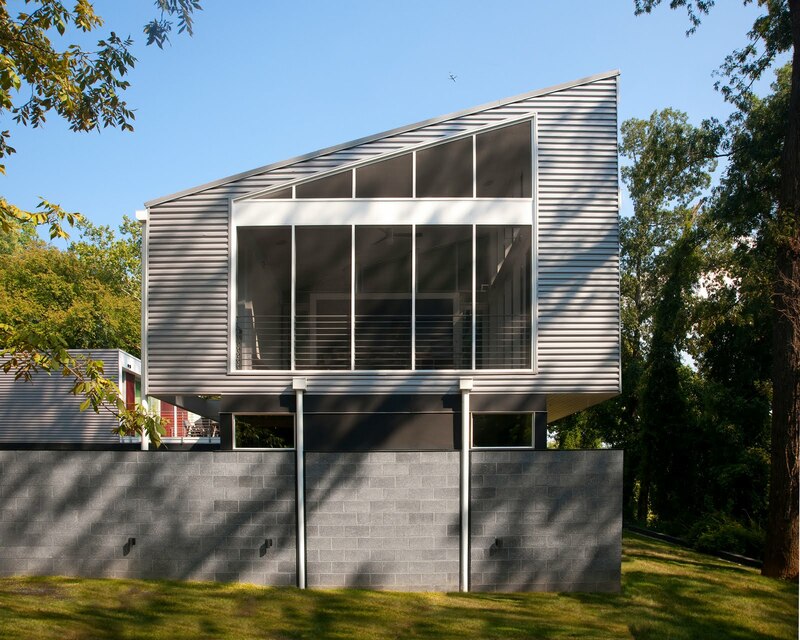 Has this home been nominated for or won any AIA awards? McInturff wins a lot of awards--I'm sure it's just a matter of time! I saw exterior blinds in Sydney, Australia, where they are not uncommon in glassy new buildings, when I was there in 2002. Loved it immediately. I'm thrilled to see someone doing it here. Doubtless there are operational complications (and if someone who operates at McInturff's typical budgets thinks it's 'not expensive', wow it must be really expensive! ), but the promise, in terms of function and aesthetics, is huge. Will Takoma Finally Embrace Its Inner Bethesda?